University of Fukui has newly established an academic exchange agreement with Hanbat National University (Daejeon, Korea). 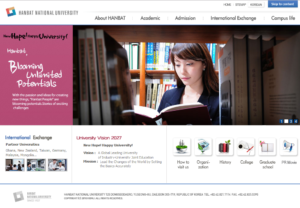 We will have student exchanges, faculty exchanges, joint research and other collaborations with Hanbat National University. We now have 136 partner institutions in 33 countries and regions (as of October 13, 2017). Please click here to see a partner institutions’ list of the University of Fukui.